I am on such a bread making kick lately and my sourdough starter has been bubbling away like mad. I have been feeding it well over the last week to get it very active for my thanksgiving bread baking. Of course, when you feed starter you need to throw some out each time. I hate to kill my babies. So, I decided instead to use the extra for pizza dough. Pizza is really easy and you can do just about anything with it. I just top it with whatever I have around at the time. My dough was made solely from flour, salt, water, a bit of oil, and my starter. Chopped garlic, dried oregano and basil, salt, pepper, pastrami, kalamata olives, fresh tomato slices and fresh mozzarella. I didn’t use a sauce on this on as I wanted the flavor of fresh tomatoes to dominate. But I do often use a simple tomato sauce. First step is to stretch the dough into a round. This is the most fun part! You get to feel the dough. Pull it. Toss it if you dare. But get it flattened out and ready to go. I brushed this with olive oil and sprinkled on the herbs, salt and pepper. I always brush my dough with oil even if I’m using sauce to prevent the dough from getting to wet from the ingredients that top it. This was topped with the fresh tomato, fresh chopped garlic, olives, pastrami and fresh mozzarella. Of course you can add just about any ingredient you like. Early in my pizza making days I made the mistake of piling on too many ingredients. Go light. Don’t overdo it. Otherwise your pizza will be too heavy, too thick and will not cook well. Here’s the final product after being baked for about 10 minutes in a hot (500 degree) oven. Of course I use a baking stone to get that crispy crust. I don’t know that there is a more versatile condiment than kimchee. This staple of the Korean diet is made from napa cabbage that is allowed to ferment with red pepper. You can eat it with rice. You can eat it in soups. You can fry it up in a savory pancake batter. Anyway you like your kimchee, its sweet, spicy, and sour flavors will add to nearly any dish. Kimchee is actually easy to make and there is no substitute for fresh homemade stuff. There are as many ways to make kimchee as there are homes in Korea. Everyone has their own family recipe so you really can’t go wrong. I have a dear friend from Korea who taught me this simple way to make kimchee using fresh ingredients. about 1/4 cup of Vietnamese nuoc mam fish sauce. I would say the most important ingredient for getting the right flavor is the Korean red pepper. I have tried other red pepper powders but nothing else will give you that authentic taste. My kimchee uses a lot (2-3 large fistfulls). It is spicy but not really that spicy. Korean red pepper has a wonderfully sweet fruity taste that accompanies the spice. It is no where near as hot as a cayenne pepper. So don’t be shy about using this much. I buy it in large bags from my local Asian grocery. To prepare the cabbages I first cut them into quarters so I can easily wash and drain them. They are then cut into pieces. You can cut them whatever size you want. I prefer them about 2 inches or so. I layer the cabbage pieces salting the layers liberally. This is allowed to sit for a couple of hours. The cabbage will drain off some of its water and will shrink in volume by about 1/3. The cabbage should be rinsed very well with cold water to remove as much salt as possible and drained. Chop the garlic finely and mince the ginger. The onions should be cut on a bias. I prefer them about 1/2 inch in size but you can cut them larger or smaller to your liking. Mix all the rest of the ingredients together well. I find that my hands work best for mixing all the ingredients. Kimchee recipes usually have some kind of fish flavor. Some call for the addition of raw oysters. Some for the brine from fermented shrimp. I find that the Vietnamese nuoc mam sauce does a great job of imparting that subtle but not overpowering flavor of the fish. The sauce smells awful on its own but you will not taste it in the kimchee. Trust me. The kimchee will not be right without it. You can use more or less to taste. If I have it I usually add a splash of the juice from my last batch of kimchee to make sure the good souring bacteria are present. Pack the kimchee tightly into a large jar or any non-reactive container you have loosely covered. Leave this sit at room temperature for 2-3 days and then store in the refrigerator. Be careful that your container has enough room at the top to allow the gases to escape. My jar shown above is probably too full and likely to spill kimchee liquid out of the top as it ferments. Kimchee will slowly ferment in the fridge. You can eat it as soon as you like. The younger it is the sweeter the cabbage tastes. If you like it more sour just let it sit longer. Actually you should try tasting it at different stages to see how it changes. In Korea they eat fresh kimchee as well as fermented kimchee. I like to let some kimchee stay in my fridge for months so I have some really sour stuff to cook with. That’s it! Just mix it up, cover it with plastic, and let it rise for about 18 hours. Fold the dough a few times and let it raise in a bowl with a floured towel inside. Let it rise again for a couple of hours. Pop it into a hot cast iron pot in a 500 degree oven. Bake it for 30 min covered and 15 minutes at 450 degrees uncovered. 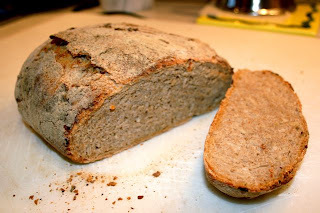 For my bread I substituted one cup of all purpose flour with 1 cup of whole wheat flour. I added 1/2 cup of dehydrated onions and 1/2 cup of my sourdough starter that I have been culturing for a couple of months. I was very pleased with the results. It has a terrific chewy crackly crust and a soft moist interior. I let the second rise go for 2.5 hours but it probably could have risen even more. For video tutorials on the no-knead bread method (and lots of other good information about bread) check out the breadtopia web site.